As a young couple on Maui we are looking for a cool, trendy place to meet others and have a dance. 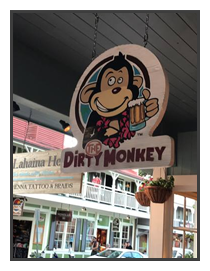 The Dirty Monkey on Front Street in Lahaina is just what we were looking for. With live music and plenty of signature drinks and drink specials to choose from, it’s got a great atmosphere that’s made even better by the small details like USB chargers under the table and purse hooks under the bar. 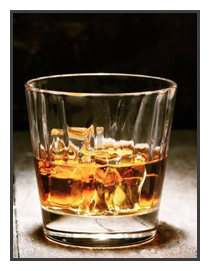 They have a HUGE selection of whiskey and also have several local craft brews – some exclusive to the bar – not to mention their great cocktail menu. The food menu is small but perfect bar food – chicken wings and their Famous Monkey Pub Chips are all that anyone needs and The Dirty Monkey does both incredibly well, along with some really unique menu items like Corn Lollipops or Shrimp N’ Grits. They also have healthy options like Quinoa & Kale Salad, or Shrimp & Avocado Salad. Everything we tried was really good. Have I mentioned the Happy Hour yet?! EVERY DAY from 3pm to 6pm. So epic! The night we went they were showing a UFC fight on their big screen TV and it’s safe to say that it was VERY busy with locals and tourists alike creating a fantastic vibe that we will be revisiting again and again before we leave the island. We went bananas for The Dirty Monkey! You can find out more at TheDirtyMonkey.com or call (808) 419-6268.